“Event Horizon” Kara Walker 2005. Photo Courtesy of Rob Corder. When I first walked into Arnold Hall on 55 West 13th St, one of the first things that caught my eye was the fluid motion of black and white shapes on the wall near the staircase. Upon closer inspection, I immediately recognized these forms as animated figures falling down a long tunnel. 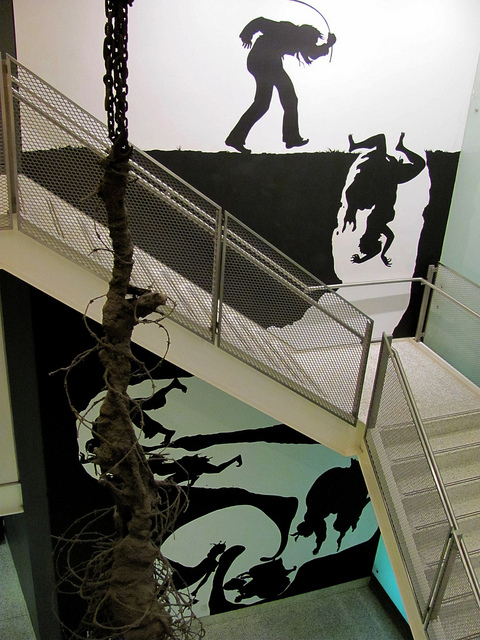 A site-specific creation, Kara Walker’s Event Horizon was her first public art installation commissioned by The New School as part of a commitment to create new art within its public spaces in 2005. It is a piece that takes up the left and right walls of the staircase entirely and provides visual movement as the viewer walks up and down. As I walk up the staircase, the white negative space of a tunnel shaped by black hills leads my eyes upward. A silhouette of a young girl sits at the outer edge of the tunnel far above my head, her hand stretched outward. A man wearing what appears to be a straw hat and rolled up pants walks barefoot upwards–seemingly bearing the weight of the tunnel on his shoulders. A woman, possibly pregnant, falls down head first towards the bottom, hands reaching for a baby who is tumbling down ahead of her. The woman’s hands, feminine and elegant, are tied. People sit in holes dug out of the tunnel, waiting, or possibly hiding, as the chaotic scene occurs outside. Being a student at the new school I remember the first time I seen this piece in the staircase and how amazed I was by it I always wondering what it was about every time I passed it. I didnt know what the piece meant until I read this post and now that I understand all I can say is WOW the artist is truly a genius. Its interesting how a piece of art fits perfectly in the context, not only in a visual and spacial way but also by complementing moments of USA’s history as you walk up the stairs, and you may choose to engage with it or keep walking by! This form of art is very unique. They are not many artists who have this unique work in universities. I am proud to go to a school that exhibits this kind of work. I believe there is another form of this work at Parsons on their third floor. I find it amazing how Kara Walker incorporates power and race into her silhouettes. In my opinion, this piece represents the harsh realities in South Carolina between the War of 1812 and the American Civil War. The never ending struggle between the oppressed and the oppressor, continuously falling in a boundless ditch. In his work, art historian and critic Darby English changes Walker’s work–like others in his How to See a Work of Art in Total Blackness–from that of a “black artist” to an artist who happens to be black. He suggests Walker’s engaged in a longer history of shadow portraits and landscape painting, and puts the viewer or visitor into the frame. As we walk the stairs, where are we in the master/slave/free person relationship? Does it change as we move between the floors, or with changes in lighting? It seems like in this case, the New School student/faculty/worker/visitor is protected from that interpellation, but I need to walk those stairs, to see shadows on the wall and experience the work. Thanks for the reminder! I’ve walked by this a dozen times and until your photo never realized there was another section below the bottom of the stairs. It’s a very interesting piece, thank you for providing an analysis of it. I loved running into this showing. I too was taken by surprise, but a good one. I enjoyed that the images were not defined, but shown in silhouette. There is something almost womb-like about this image, which I find ironic and comforting given its nature. Great post.